With THE SMALLEST PART, Amy Harmon imparts a story of unwavering friendship, of love longed for and love lost, of hardships and hope, and all the beauty in between. This emotional story exquisitely comes to life in Harmon’s poetic style, as we get to know three kids who found each other, and clung to each other despite the hardships they struggled against. 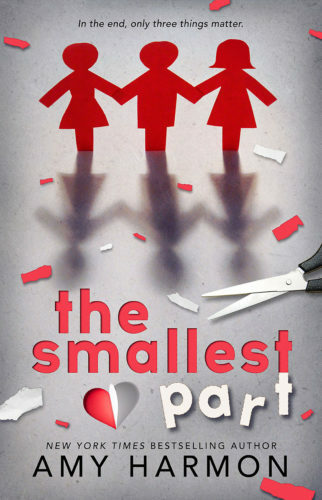 We meet Noah, Mercedes and Cora, first as children, as they battled insecurities and less-than-perfect upbringings. Noah was exceedingly kind and selfless, while Mercedes was spirited and staunchly loyal. Cora was the last in to the fold, and more than anything, she wanted to belong and be seen, to be enough. Years fed the feelings that both Mercedes and Cora felt for Noah, but in the end, it was Cora who got the boy, as Mercedes made way for their relationship to bloom and grow. Mercedes was there for every moment of their life. She was the glue, the caretaker and problem solver—the levity often needed in a life that wasn’t as idyllic as imagined. And when everything fell apart, and the bottom was pulled from under them, Mercedes was there again, to pick up the pieces. Theirs is a story of friendship, the strength and fragility of it, of secrets and truths with the power to change everything. It was funny in parts, devastating in others, but all of it was poignant and deeply felt. I loved Mercedes so much, she is a wonderful, unforgettable protagonist, and a glue that held this narrative together too. This slow-burning, friends-to-lovers romance was a joy to read, and if you’ve read Harmon’s other novels, you’ll love seeing some familiar faces. This one is a novel that shouldn’t be missed.